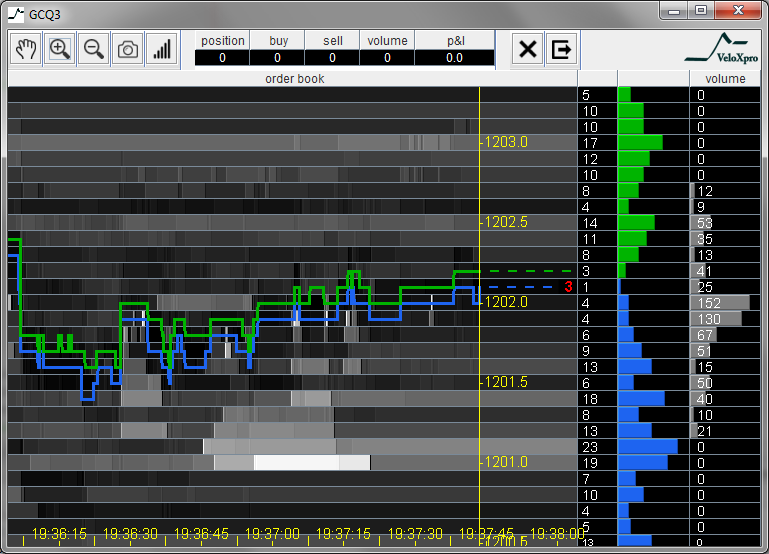 Order book visualization. Show the bids and asks in standard book form. Order by order or level aggregation. "VCR style" controls that allow one to easily scan through the book across time. Multiple venue support. Depth of book data from more than one venue is maintained as a separate book for a given instrument, but an aggregated "virtual" book can be displayed. Descriptive statistics could be calculated across arbitrary time periods (# of orders added, deleted, etc. Any suggestions on tools that might help in this type of analysis are welcome as are suggestions of features not listed here but that are provided by software packages available today. In the IBrokers package, the function "reqMktDepth" is used for streaming order book data. So one such visualization package is demonstrated in http://www.tradeworx.com/movie/booklet_demo/temp/booklet_demo2.mov. AFAICT it looks like a tk script. Trading Technologies (TT) sells another visualization tool. But TBH writing your own tool takes a few hours and allows you to focus on what information you are interested in finding. I came across B/View which is a Java application that visualizes the order book for a single stock on a single day. It encompasses some of the basic features I would expect in such a tool. It appears to be more a demonstration than a general purpose tool. It allows to trade and simulate trading in real-time or replay mode. The replay mode is free to use. Take a look a EclipseTrader. The moderator Bob Jansen deleted my previous response without meaningful comment. Bob, please explain why highchart heatmap cannot be used to "order track through time". You need a heat map to do that. I recommended the Heatmap plugin for Highcharts. It is absolutely capable of everything that "Bookmap" (as recommened by Serg) does; as bookmap is really just another heatmap utility with a gui interface. I really have no idea why this was not an adequate response. Its even offered as a free web utility for trial and its compatible with python. Not the answer you're looking for? Browse other questions tagged r software limit-order-book visualization python or ask your own question.